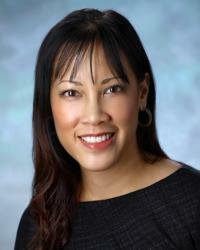 Christine Trankiem Wall, MD, is a board-certified general surgeon and critical care surgeon. She is Program Director of the Surgical Critical Care Fellowship and Medical Director of the Trauma and Burn Intensive Care Unit at MedStar Washington Hospital Center. Dr. Trankiem is a state faculty member for the American College of Surgeons Committee on Trauma and participates in the education of medical students, physicians in training, and peers. She is Chair of the Organ, Eye, and Tissue Donation Committee, Chair of the Spiritual Care Advisory Board and is on the Medical Board of the hospital. Dr. Trankiem specializes in trauma, general surgery including gastrointestinal and bowel surgery, and surgical critical care. Her clinical interests include trauma surgery, gastrointestinal surgery, necrotizing acute soft tissue infections (or flesh eating bacteria), and organ donation. As part of the Gold General Surgery Team at MedStar Washington Hospital Center, Dr. Trankiem has an added level of expertise in taking care of patients with seemingly straightforward general surgery issues that may develop into critical care needs. Patients who come to MedStar for care will also be treated by other physicians in the Gold General Surgery Team, in addition to being treated by Dr. Trankiem. Dr. Trankiem earned her undergraduate degree from the Honors College at the University of Pittsburgh, pursued post-baccalaureate studies at the University of Pennsylvania, and obtained her medical degree from MCP Hahnemann School of Medicine. She completed her general surgery residency at Temple University Hospital in Philadelphia and completed her fellowship training with the Division of Trauma and Surgical Critical Care at Los Angeles County Hospital at the University of Southern California. Born and raised in the Philadelphia area, Dr. Trankiem came to Washington, DC for the opportunity to provide advanced trauma and surgical care to area residents. Dr. Trankiem is an advocate for team care. Data shows that a team always outperforms an individual. For this reason, she is passionate about surgical education and critical events team training. When not searching for innovative approaches to care for trauma patients, Dr. Trankiem enjoys spending time with her husband and son hiking, white water rafting, and adventure travelling.